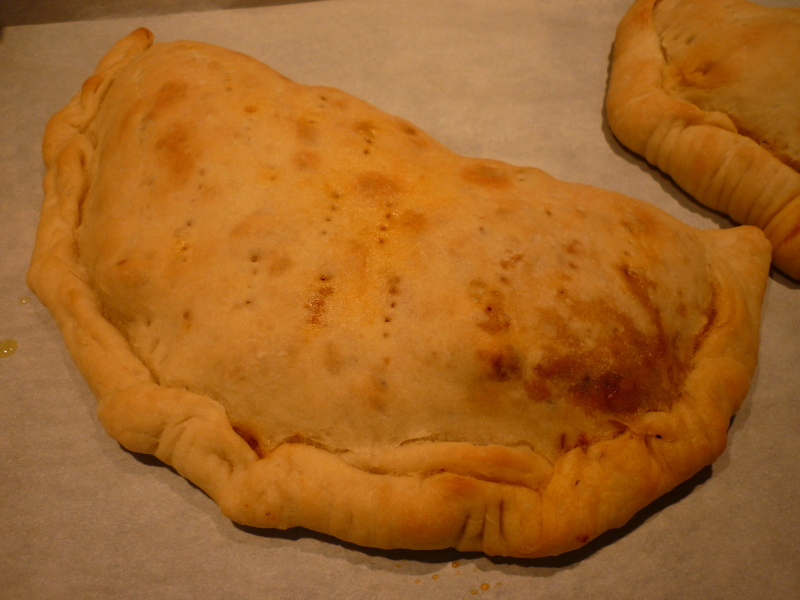 This is bread stuffed with pizza filling. These travel nicely or go great in the lunchbox for a hearty meal. Dough: Sprinkle 1 pkg (2¼ tsp.) active dry yeast over 1 cup warm water and let stand about five minutes to soften. Stir in ½ tsp. salt and 2 tsp. olive oil. Gradually mix in 2½ to 3 cups flour to make a soft dough. Knead until smooth, adding more flour as needed. Place in greased bowl; turn dough to grease the top. Cover and let rise in warm place until doubled (about 1 hour). In a wide frying pan over medium heat, cook 12 to 16 oz. Italian sausage. 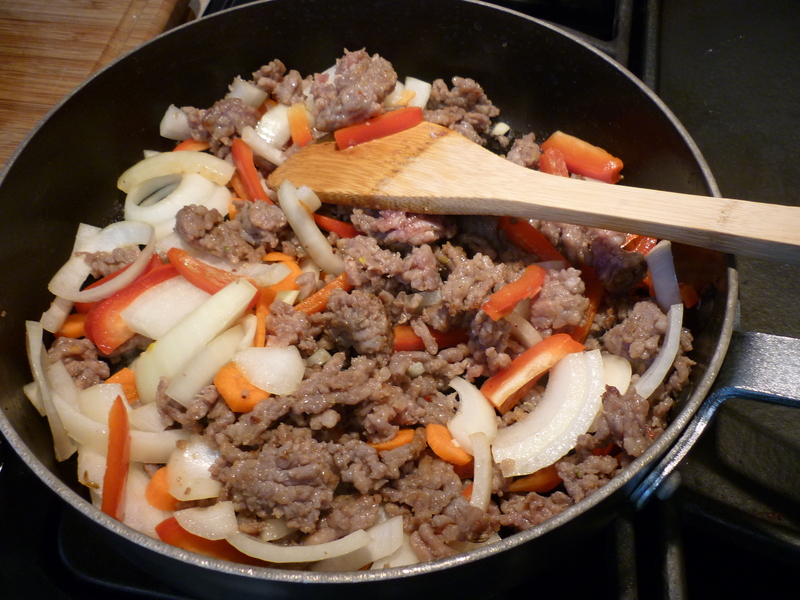 Add 1 small sliced onion, 1 minced garlic clove, 1 small sliced bell pepper, and 1 small thinly sliced carrot. Cook, stirring, until vegetables are limp. Stir in 1 8-oz. can tomato sauce, 1 2¼-oz. can sliced black olives, 1 tsp. dry basil, ½ tsp. each oregano and sugar, and ¼ tsp. red pepper flakes. Reduce heat and simmer, uncovered, for about 5 minutes. Let cool. When ready to assemble the Calzone, stir 2 cups (8 oz.) 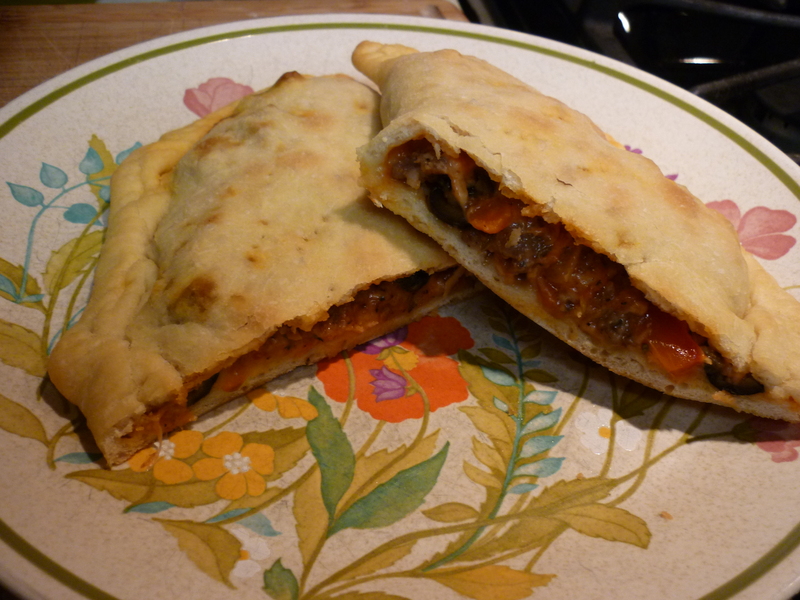 shredded mozzarella cheese and ½ cup grated Parmesan cheese into the filling. Salt and pepper to taste. Divide the filling into four portions. 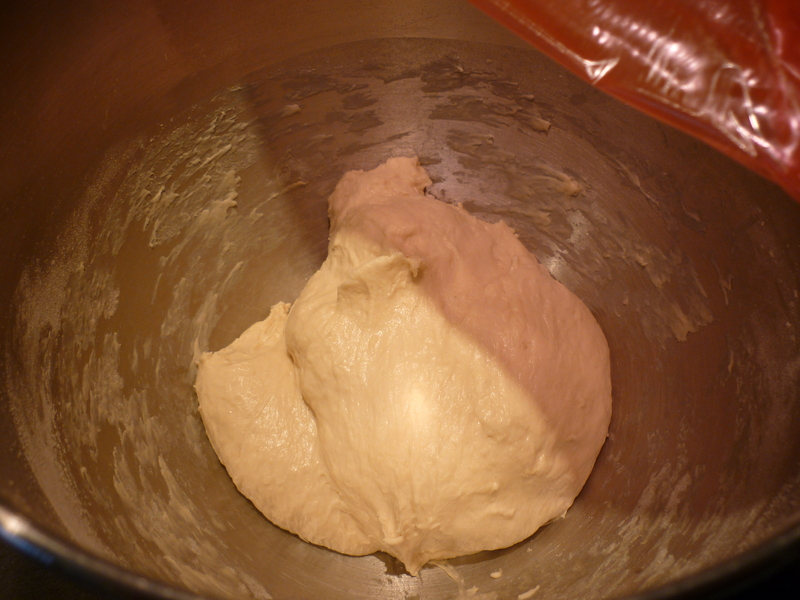 After dough has risen, punch it down and divide into four portions. 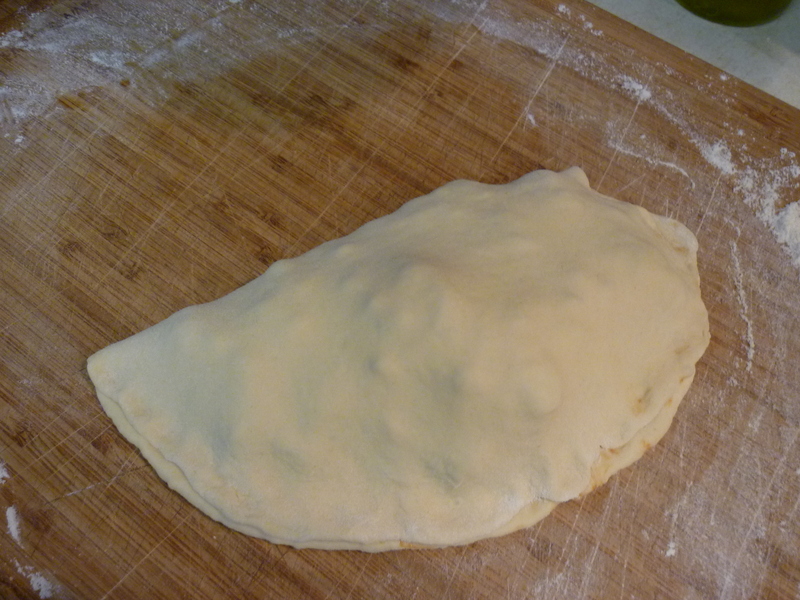 On a lightly floured board, roll out each portion into a circle, about 8½ inches across. Spread ¼ of the filling over half of each dough circle. 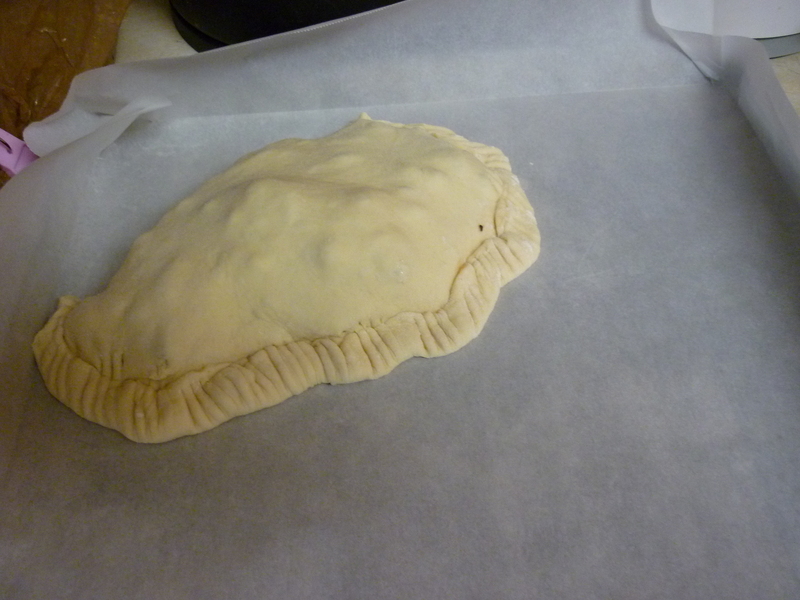 Fold the plain half over the filling, then press the edges together. Roll ½ inch of pressed edges up and over; then seal and crimp with a fork. 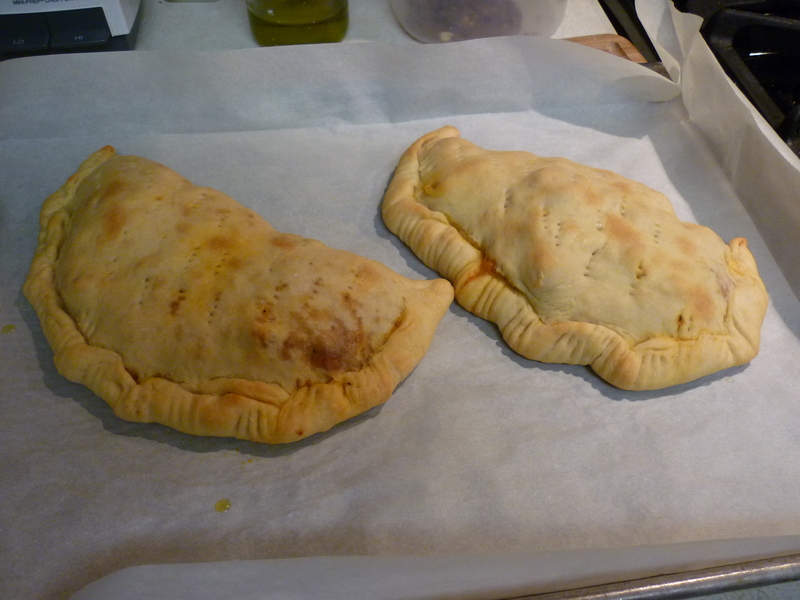 Transfer Calzones to parchment-lined baking sheets and prick the tops with a fork and brush lightly with olive oil. Bake at 400 degrees for 15 to 20 minutes or until well browned. Serves 4. Sprinkle 1 pkg (2¼ tsp.) active dry yeast over 1 cup warm water and let stand about five minutes to soften. Stir in ½ tsp. salt and 2 tsp. olive oil. Gradually mix in 2-½ to 3 cups flour to make a soft dough. Knead until smooth, adding more flour as needed. Place in greased bowl; turn dough to grease the top. Cover and let rise in warm place until doubled (about 1 hour). In a wide frying pan over medium heat, cook 12 to 16 oz. Italian sausage. 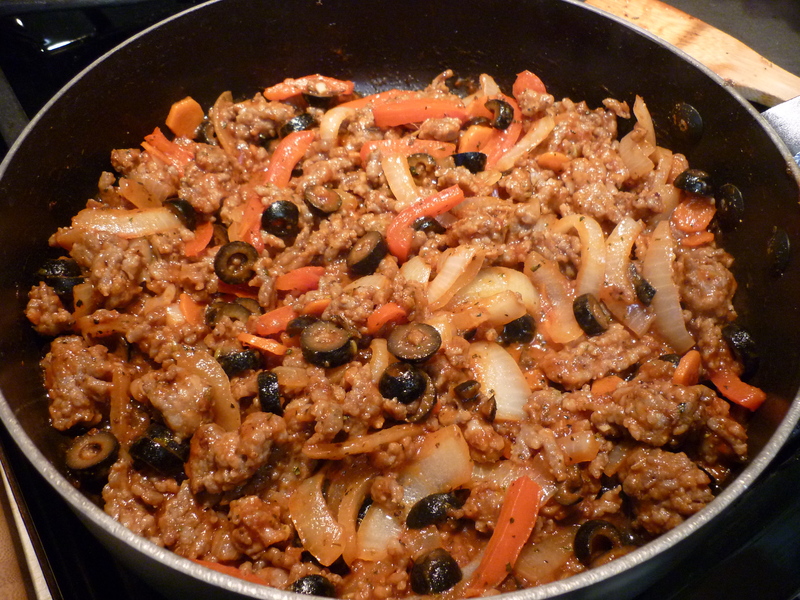 Add 1 small sliced onion, 1 minced garlic clove, 1 small sliced bell pepper, and 1 small thinly sliced carrot. Cook, stirring, until vegetables are limp. Stir in 1 8-oz. can tomato sauce, 1 2¼-oz. can sliced black olives, 1 tsp. dry basil, ½ tsp. each oregano and sugar, and ¼ tsp. red pepper flakes. Reduce heat and simmer, uncovered, for about 5 minutes. Let cool. When ready to assemble the Calzone, stir 2 cups (8 oz.) 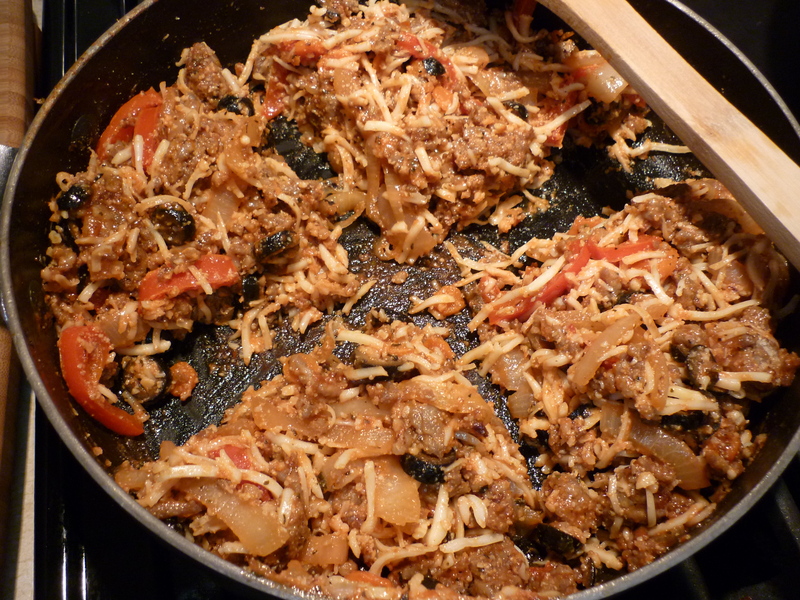 shredded mozzarella cheese and ½ cup grated Parmesan cheese into the filling. Salt and pepper to taste. 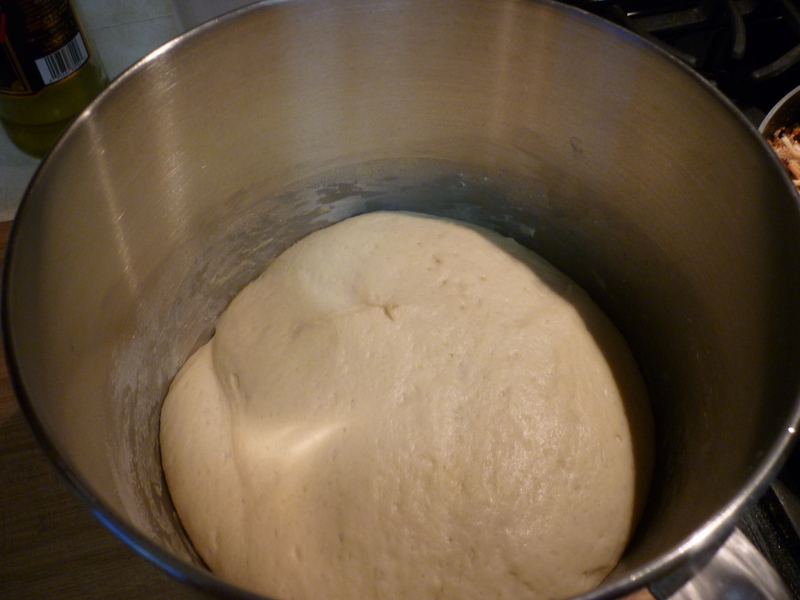 After dough has risen, punch it down and divide into four portions. On a lightly floured board, roll out each portion into a circle, about 8½ inches across. Spread ¼ of the filling over half of each dough circle. 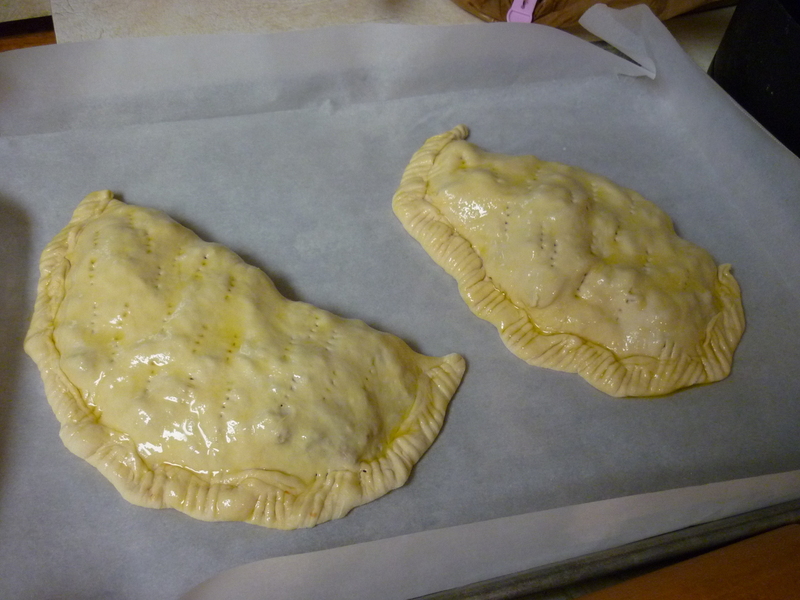 Fold the plain half over the filling, then press the edges together. Roll ½ inch of pressed edges up and over; then seal and crimp with a fork. 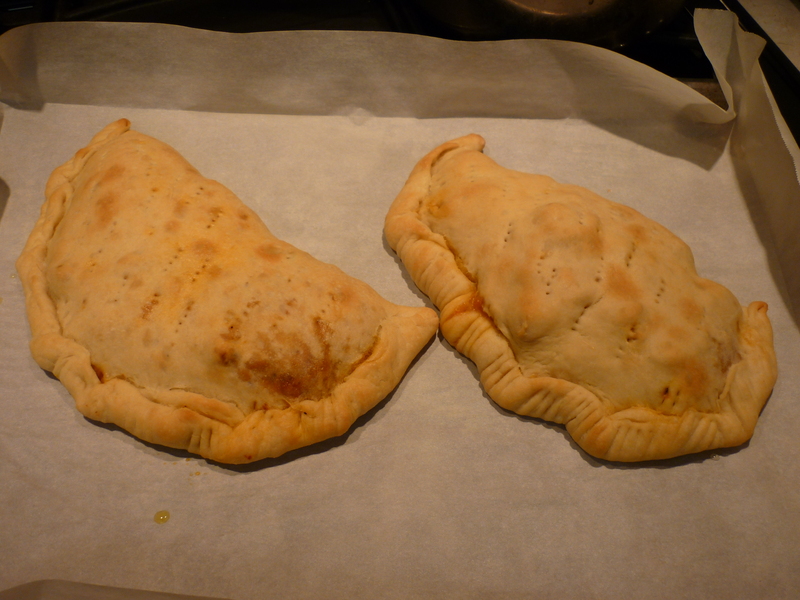 Transfer Calzones to parchment-lined baking sheets and prick the tops with a fork and brush lightly with olive oil. Bake at 400 degrees for 15 to 20 minutes or until well browned. Serves 4.